Luxurious modern living in the hottest community in The District. 14W is surrounded by cutting edge boutiques, vibrant nightlife, arts and music venues. Plus indulge in a home with high-end finishes and amenities. Excellent place to live! Friendly, helpful and available staff. Great community for the younger generation. Location and community amenities are really suited to all ages! However, with the newer buildings going up in the area, I believe I would be tempted to check out what else was available, especially having everything in my home be new and up to date. I think this is a great place to live if you have the means. I think there are other places in dc that are more affordable and still deliver on quality. Unless there is a response or acknowledgment of why the maintenance people have walked into my apartment without permission, i will never recommend this place and I will make sure everyone knows about such a serious problem. I pay to feel safe and secure, not to feel that someone can walk into my apartment at any given time without prior consent. Inconsistent and opaque lease renewal conditions: why do you often only offer leases of 8 or 10 months? Long term residents would appreciate more stability. We are very disappointed with the new roof furniture. There used to be high top tables which were great for having dinner together. These are gone. The new couches are awkward and uninviting. Other DC apartments have much better roof amenities. It is a great area to be around and the building management takes a good care of the residents. Safety, soundproofing, front desk staff are all great. 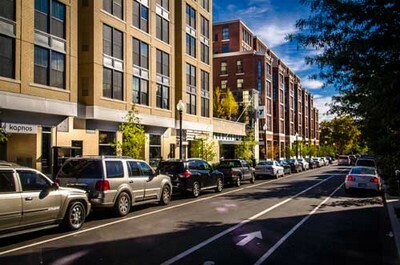 Location is super convenient to much of DC. No problems in almost 2 years. The layout of the apartment is wonky. Given the cost, a more standard layout would provide more actual useable space in the studio. The staff, building, location are all top notch. Thank you so much for the positive feedback! It has been our pleasure to have you as a resident at 14W this past year and we look forward to many more! In the 7 months I've been here, I haven't had any bad experiences with the building or staff. I also appreciate the neighborhood discounts. Like I've stated, the only frustration/disappointment I've had is the WeWork. Thank you for this feedback. We will reach out to WeWork and address your concern. Thank you for bringing this to our attention. Likely if they are young and don't mind the noise and small apartments (for the price paid). Tanzina, Thank you for taking the time to take our survey. We are sad to hear that you do not plan to stay here at 14W. Perhaps we can schedule a time for you to meet one of us in the office to discuss any and all option we have available that suit your needs as a means for you to stay. Please let me know if this is something you would be willing to consider! Thank you for the very positive feedback given on your recent survey! I am so glad that you really enjoy living here and that our staff has provided you such great customer service. I know this area is expensive. Just know that when it is time for your renewal, we will offer you the most competitive rate possible. Our goal is to have you remain a part of the 14W family! For anyone looking for an apartment in this area, I would definitely recommend 14W. Thank you for taking the time to give us feedback on your recent survey! I do have great news for you! We have ordered additional equipment for the fitness center and have budgeted for a big umbrella on the rooftop this year in response to feedback last year. Also, the building behind us is currently under construction and will be a WeWorks building with retail spaces, which will bring some additional restaurant options to our neighborhood. I think you will be satisfied with the final result. If you have any specific fitness center equipment you would like to see, please let me know so I can take it into consideration when writing our 2017 budgets. We get our best ideas from feedback such as yours! Thanks Again! I would recommend with a few honest caveats about the constant noise from the YMCA and immature residents. Thank you for responding to your resident survey. I do appreciate the feedback as it best helps us know what we can improve upon. I am sorry that you have had an issue with the noise from the YMCA and do want to assure you that we give these types of complaints top priority. Every complaint is addressed immediately and the Y is dedicated to working with us to minimize noise. Specific plans are being discussed that will hopefully satisfy everyone involved. Also, we have a concierge team 24 hours a day that will gladly address any noise complaints regarding your neighbors as it is happening. Feel free to contact me directly, with questions or concerns, at any time. Have a great day!